The most interesting city views are near the Chicago River, flowing in the very heart of the city. Chicago is situated in the northeastern part of the state of Illinois, on the south-western shore of Lake Michigan. It is also situated on the banks of the Chicago River and of the Calumet River. Now Chicago is the second most important financial center of the country, next to New York, and the largest transport hub of North America. The population of Chicago is 2,700,000 people. The Chicago agglomeration is called “Big Chicago”, or “Chicagoland”; about 9.5 million people live there. The Chicago agglomeration occupies the 26th position in the world for the number of people living there. Chicago emerged on the map in 1833 as a settlement with the population of 350 people. In 1837 Chicago was assigned the status of a city, and already in 1840 its population reached 4,000 people. In 1871, the greater part of the city got burnt in the Great Chicago Fire. That allowed the possibility of rebuilding the city and encouraged the greatest construction boom in the USA, which made Chicago the architectural center of the country. It was in Chicago that the world’s first skyscraper was built in 1885. The Tribune Tower and the Wrigley Building behind it. We’ve been testing the Huawei Ascend P7 smartphone for the past few months, and it has been great to travel with. It has a 5-inch screen with very clear resolution. 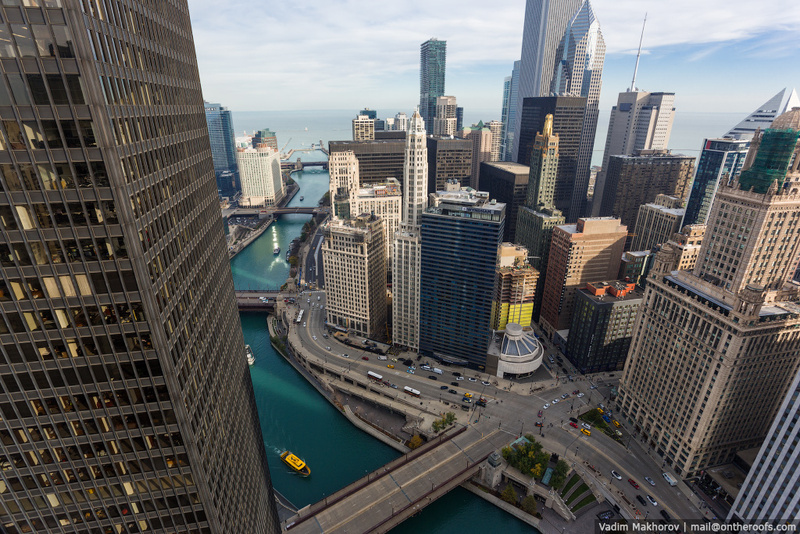 Vitaliy is taking panoramic photos of Chicago with his Ascend P7 mobile phone. The Trump Tower in Chicago sticks up in the city panorama like a big middle finger challenge to the whole city. One can see the big letters TRUMP on the building. The say, the residents of Chicago were against installation of such big letters, as they spoilt the city view. The Russian people, who have already adapted themselves to living among the advertising junk, may be surprised to hear that, just as I was surprised. In fact, these letters do look alien. All the buildings in Chicago are free from advertising materials and any other signs. The height of the tower is 415 m.
The Marina City towers. People just call these buildings corncobs. Their height is 179 meters (65 floors). Marina City became the first tower residential community in the USA, built after the Second World War. In everybody’s opinion, this project became the starting point for building residential communities of this type all over the country. The shore of Lake Michigan. Huawei Ascend P7. You can easily edit photos directly on the phone which can be useful when you travel. The Willis Tower (the Sears Tower before 2009): once it was the tallest building in the world: now it’s the tallest building in Chicago. The height of the entire building together with the spires is 527 m. There is a cool observation site on the 103rd floor, and it’s a must. The observation site is covered with glass, but this doesn’t prevent the visitors from taking cool pics even through the glass. The observation has a balcony with a see-through floor. It’s difficult for many to cope with their fears and to step on the glass floor. The floor glass is very hard, and there’s nothing to be scared of. In this picture, we’re saying “good-bye” to Chicago, looking forward to seeing Las Vegas. Our travel in the United States had been planned from beginning to end. After Chicago, there was the Grand Canyon. We came to Los Angeles by plane, rented a car and started our car trip across the USA. On the way to the Grand Canyon, we spent a night in Las Vegas. I think everyone knows what Las Vegas is. It is the Casino City! In Las Vegas, everything is done in such a way so that a tourist could leave more money in this place than originally planned. Even we rode a roller-coaster there (in Russian, this amusement is called “American hills”). Yet, just like everywhere, everything that is made for tourists looks unreal and temporary. The US is no exception in this. Whether Hollywood or Las Vegas, all this reminds of scenery for movies. All the buildings you see in the pictures are casinos. As we woke up early in the morning, we moved to the Grand Canyon, having visited the Zion National Park on the way. These are turs on top of one of the rocks. Down the road, we came across the Horseshoe Bend, a meander of the Colorado River in the territory of the Glen canyon. We came to the Grand Canyon deep at night. We slept in the car, having a splendid view in front of us. Grand Canyon is one of the deepest canyons in the world. Its length is 446 kilometers. Its width (at the plateau level) varies from 6 to 29 kilometers, and it is less than a kilometer at the bottom. Its depth reaches 1,800 meters. Grand Canyon is one of the most unusual geological sites of our planet, so it’s well explored. One can find the traces of four geological eras of the Earth, a variety of rocks and caves, containing rich geological, biological, and archeological materials. The canyon is considered to be one of the best examples of soil erosion. Originally the Colorado River flew along a plain, but, resulting from the movement of the earth crust about 65 million years ago, the Colorado plateau rose. As a result of this rise, the inclination angle of the Colorado River’s flow changed, and its flow velocity and the ability to destroy the rock on its way rose, too. First of all, the river eroded the upper limestone and then it started to wash out the deeper and more ancient sandstone and cleaving stone. This is how the Grand Canyon was formed. It occurred about 5—6 million years ago. The Canyon is still growing due to continuing erosion. Sometimes, because of the constant strong winds, the trees here are twisted in peculiar ways. There are paths on which one can walk down to the very bottom of the canyon to the Colorado River. A tourist scenic site. There are many such sites along the canyon. After the Grand Canyon, we went to San Francisco. We decided to go across the Death Valley, which is one of the emptiest and hottest places on earth. Here the highest air temperature, +56.7 °C was registered. In the USA, tourists feel very comfortable. People do not have to look for interesting viewpoints themselves. One can often see signs like “View point” or “Scenic view”, suggesting places with beautiful views. The US highways may be loved not only for the good quality but also for such sights. On the way from the Death Valley to San Francisco. We have reached San Francisco. At this point of our trip, we had neither strength nor time to climb the roofs. Only a few days were left before the departure, and there were still Los Angeles and the Muir Woods with huge sequoias to see. San Francisco is built on hills. The highway may be so steep that I sometimes thought whether we would turn over or not. And then I fully appreciated the automatic gearbox. San Francisco has two suspension bridges, one of which is the famous Golden Gate Bridge. This is the Bay Bridge. And this is the Golden Gate Bridge. Perhaps, we would have tried to climb it, as we had already done with the tallest suspension bridge on earth, the Akashi Kaikyo Bridge in Japan, yet the risk of being caught was rather high. The bridge is popular with suicides, so there are too many cameras and guards there. None of us wanted to celebrate the New Year in jail, so we just looked at the bridge. Yet, the point from which this photo was taken is one of the coolest and most atmospheric sites I have visited on my trips. Bird Vladislav from anywayanyday our talisman in trip. A Chinese container truck and the notorious Alcatraz prison at the background. The Muir Woods, located next to San Francisco. Here grow the tallest sequoias, up to 70 meters tall and several hundred years old. We drove along the shore of the Pacific Ocean to cover the distance between San Francisco and Los Angeles. Sea elephants, or elephant seals. Los Angeles. We spent only a day there. On one of the last days of our trip, we went to Tijuana, a borderline city in Mexico. We were driven by the desire to see real Mexico and moustache-decorated men wearing sombreros and to taste tequila. Actually, Tijuana turned out to be a dump, which hardly characterizes the country of Mexico. If you value your time, do not go there. But we did enjoy our time travelling to the West Coast, and we managed to visit some beautiful places. Here are a few panoramic photos of our trip taken with a Huawei Ascend P7 phone. Under correct conditions, one can achieve ideal panorama shots using the smartphone, especially with the 13MP rear-facing camera. Thanks anywayanyday in support of this trip!